As one of a gaggle of Oscar-nominated films, Three Billboards Outside Ebbing, Missouri is the creation of writer/director Martin McDonagh who had Golden Globe and Academy Award winner Frances McDormand in mind when he created the lead role of Mildred Hayes, a middle-aged divorcee who owns a small gift shop and whose only daughter Angela (Kathryn Newton) was brutally raped and murdered eight months earlier. 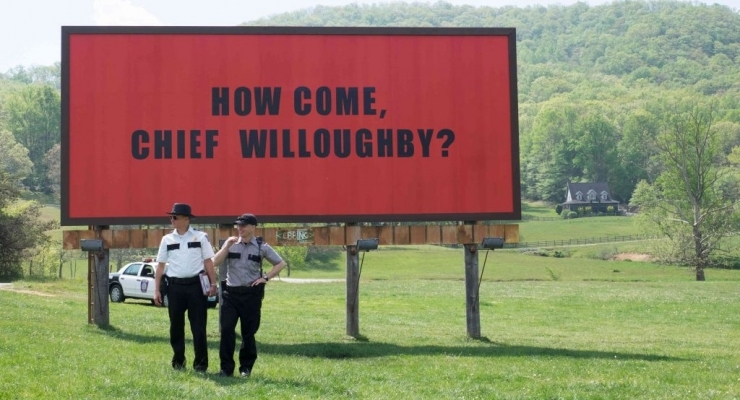 This unsolved crime prompts the grieving mother to pay for three previously vacant billboards containing the following messages, “RAPED WHILE DYING,” “AND STILL NO ARRESTS,” “HOW COME CHIEF WILLOUGHBY?” purchased from Red Welby’s (Caleb Landry Jones) advertising company. Police Chief Bill Willoughby (Woody Harrelson), one of the film’s very few sympathetic characters, has terminal pancreatic cancer. He is understandably depressed, not only by these billboards but also by the prospects of leaving behind his young wife Anne (Abbie Cornish) and two small daughters, Polly and Jane (Riya Mae and Selah Atwood). Mildred’s life is completely in the dumpster. She has no prospects of getting her daughter’s cold murder case solved, her son Robbie (Lucas Hedges) is being harassed at his high school, and, to top things off, her abusive ex-husband Charlie (John Hawkes) drops by with his 19 year-old bimbo Penelope (Samara Weaving) in tow and immediately berates Mildred for contributing to Angela’s death. Officer Jason Dixon (Sam Rockwell) is a redneck bigot with a drinking problem, short on professional skills and impulse control, and, as is most of this small tightly knit community clearly upset by Mildred’s billboards. The emotional apex of the film is reached when Chief Willoughby commits suicide and leaves letters, read in his beyond-the-grave voice, for Anne, Mildred, and Jason that attempt to bring closure and insight to those three people. As an ironic gesture, Willoughby has also left a cash payment to Welby’s business that will keep the demeaning billboards in place for at least one more month. Mildred remains at odds with a local police department she deems incompetent and to which she will eventually mete out her own brand of vigilante justice. While billed as a “dark comedy,” outside of the ironic name given Mildred’s “Southern Charm” gift shop, her off-base attempt to equate the Catholic clergy to Los Angeles street gangs, Penelope’s malapropisms, and recurring references to dwarf James’ (Peter Dinklage) diminutive size, those who might have anticipated the dark humor of films like Fargo will leave scratching their heads over Three Billboards. Martin McDonagh’s script delivers an increasingly oppressive bleakness, punctuated by episodes of graphic violence and a continual torrent of profanity that become wearisome. Frances McDormand is one of today’s most talented actresses and the principal reason for audiences to seek out Three Billboards. She made a game effort to negotiate her essentially two-dimensional role as the disagreeable and downright shrewish Mildred Hayes, a character that tried my patience and foiled any attempts at my empathy. Woody Harrelson departs from the film much too soon while Peter Dinklage makes the most of his limited screen time. The most complex, challenging, and best-developed character turns out to be Sam Rockwell’s Jason who embarks on a long journey toward personal redemption that remains unfinished at the film’s uncertain ending. I am fully aware that Three Billboards got Golden Globes Awards and is in the running for several Oscars. That said, this film is simply not in the same league as most of the other Best Picture nominees, and suffers from having a writer/director who is clearly more at home on the theatrical stage, and is apparently daunted by having to create a work that carries its own weight on the big screen. 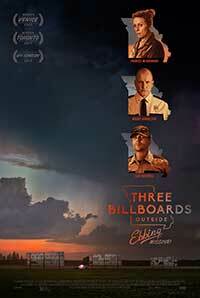 When local law enforcement fail to catch her daughter's killer, a woman in Ebbing, Missouri (Frances McDormand) challenges their commitment by putting up three confrontational billboards. A film headlined by star performer Frances McDormand, Three Billboards ultimately succumbs to a less than stellar script and lackluster direction.